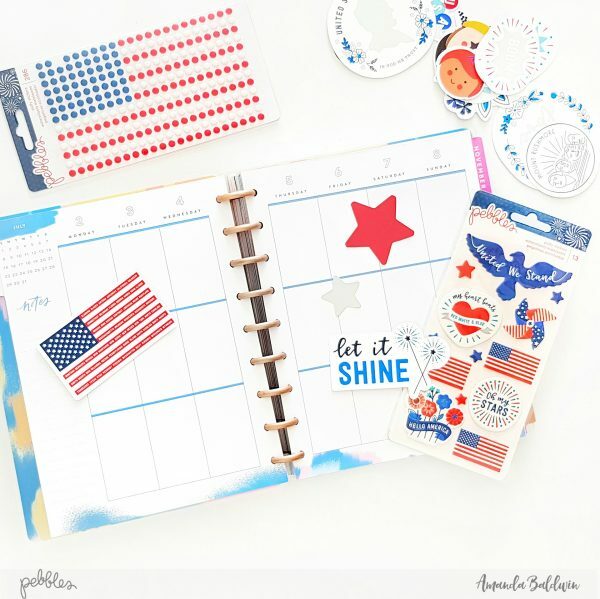 Holiday Archives - Pebbles, Inc.
Planner Pages with Amanda & The Land That I Love! 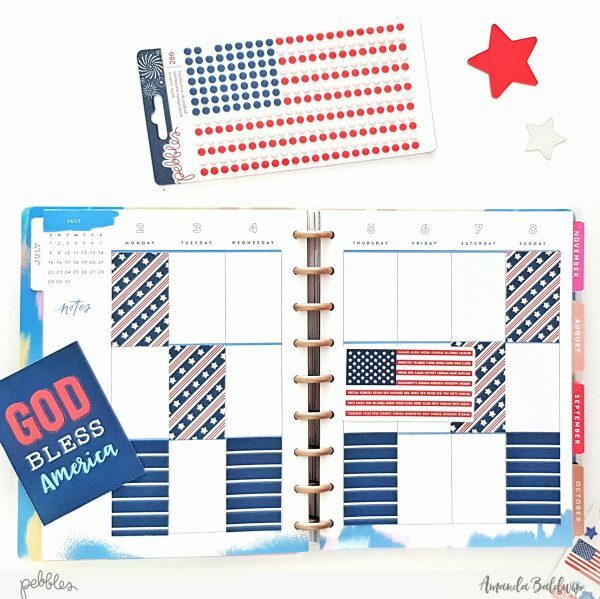 Amanda here; today I am sharing one of the most loved Holidays in the planner girls’ calendar – the 4th of July! 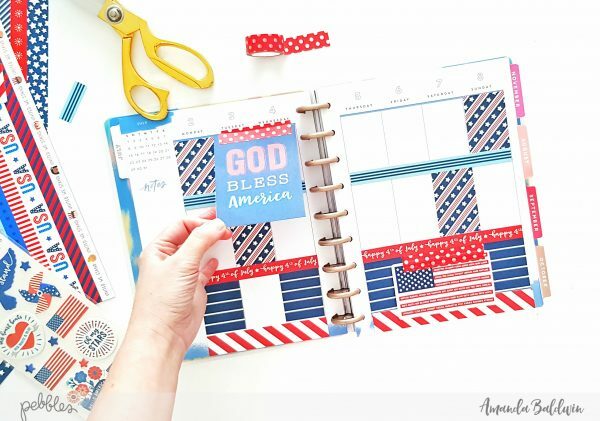 “Oh say, can you see….” I’m singing as I type this post, and feeling all the Land of the Free feels right now! 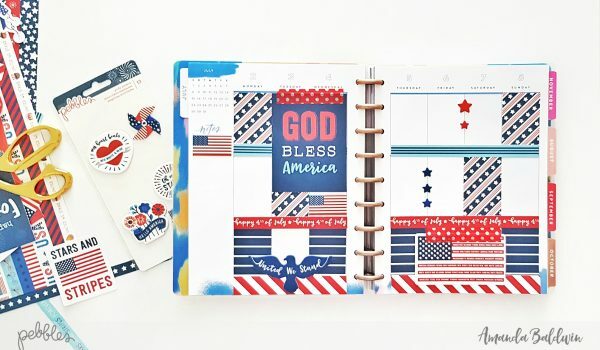 This is such a wonderful holiday to celebrate, and I just love the Red, White & Blue adorning the pages of my weekly view planner! Forget functionality, this week is all about showing your stripes – and plenty of them! Here’s how I’ve prepared my pages for this special occasion…. As I’m quite the planner addict, you’ll spot that this is yet another new planner in my stash! (Sssh! Don’t tell Mr Baldwin – he doesn’t need to know 😉 ) You’ll note that this a much larger size and more ‘boxed’ style of planner (it’s a MAMBI Happy Planner) compared to my previous planner & traveler’s notebook shares. The great thing is that regardless of planner size or type, you can take the ideas from this post and edit them to best suit your daily organizer needs. Yay! 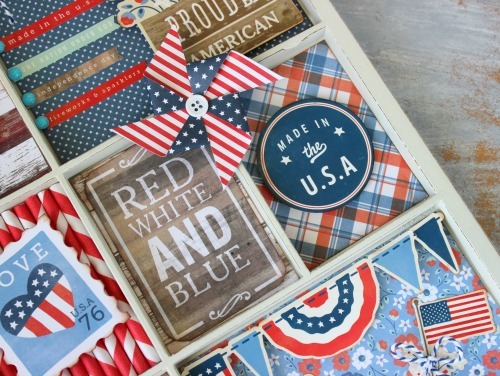 Here’s how I created this patriotic spread…. First you’ll need to gather up your Pebbles: Land That I Love supplies. 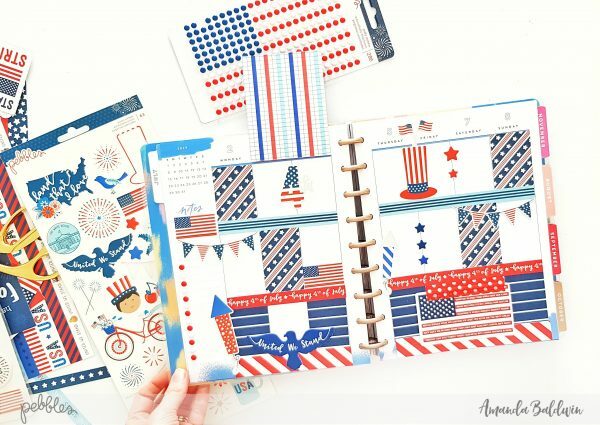 As well as embellishments, you’ll also need pattern papers Stars & Stripes Forever, Happy 4th! and Land That I Love. I just LOVE those Puffy Stickers! Oh My Stars, indeed! I start with creating the full size decorator boxes. 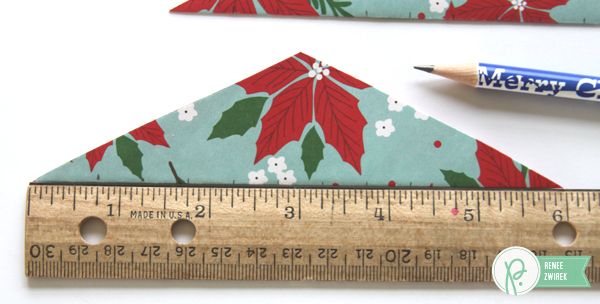 For this specific project, that means trimming pattern paper Stars & Stripes Forever to size 1 1/2″ wide x 2 1/2″ long. 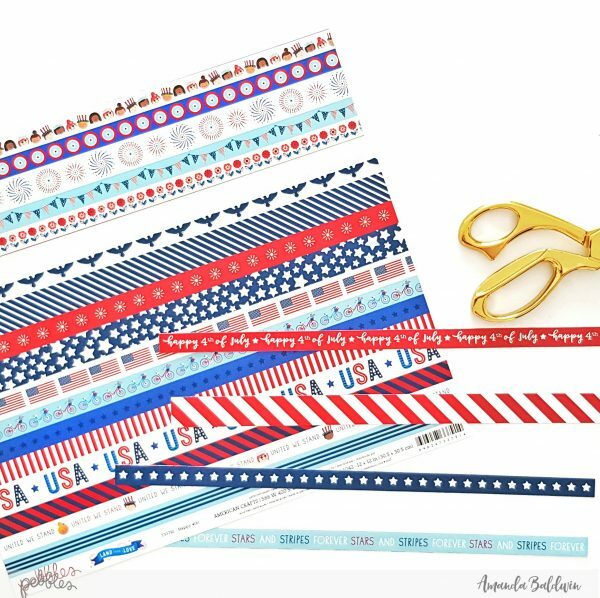 One 2 1/2″ x 12″strip will create exactly 8 boxes, with the choice of two patterns – stars and stripes OR blue with white stripes. Adhere to your pages as shown above. 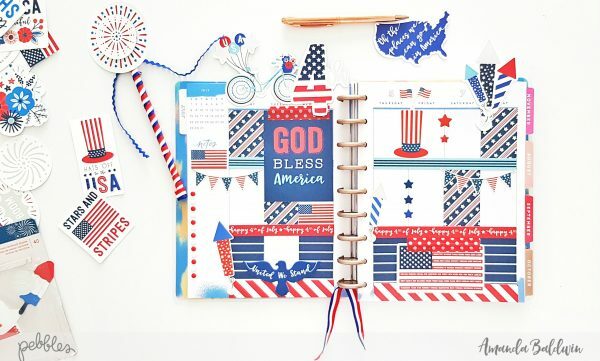 Next, take pattern paper Happy 4th! 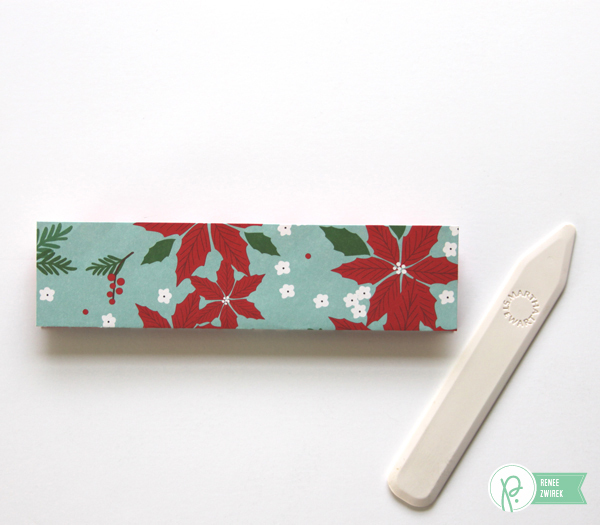 and trim all the ‘strips’ to create faux washi tape. Trim to size, and adhere with glue. This is already starting to look good! 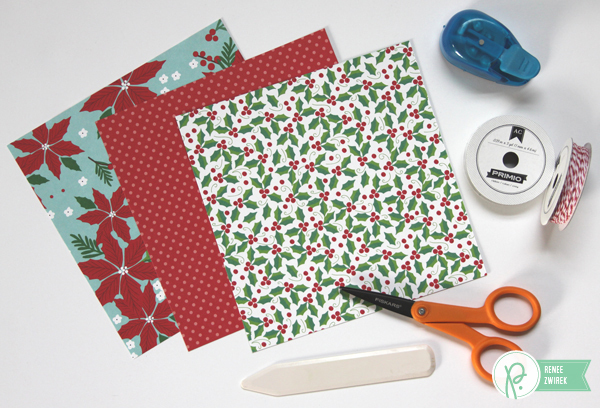 Trim a 3″ x 4″ card from pattern paper Land That I Love, and create a ‘flap’ or two for hidden planning! I have a Printed Cardstock Shape flag as my second flap. I took out some red tape from my stash to secure them in place. Decorate with a few Puffy Stickers! You’ll see that I have cleverly positioned my puffy star stickers to double up as ‘dot points’ in my planner! Much more fun than asterisks or bullet points! I put in more Puffy Stickers, and embellished them with the 6 x 12 Accent stickers too! You can never have too many stickers! Next I created a few planner clips for the top of my page. 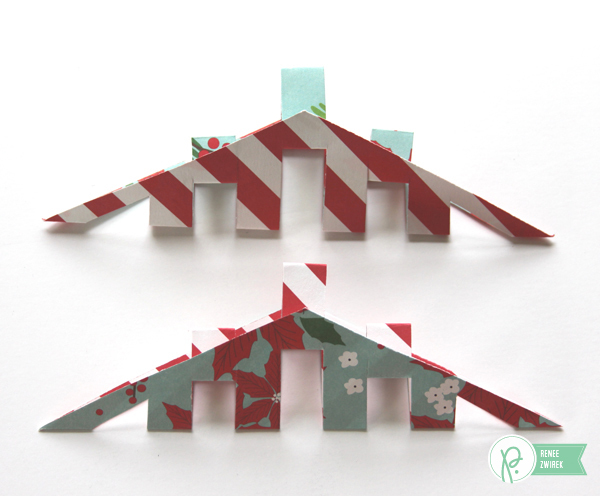 To make, simply hot glue some of the Printed Cardstock Shapes to metal paperclips. 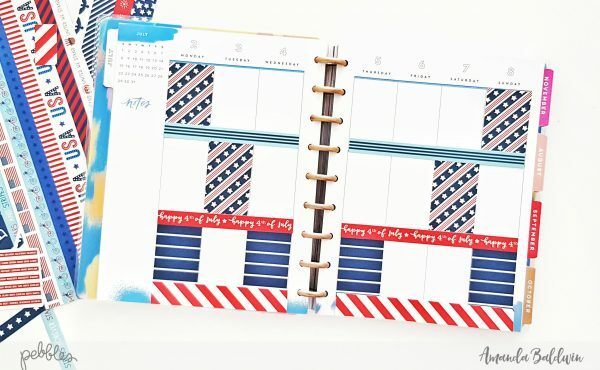 For finishing touches, I tied a patriotic ribbon to the base of my planner to act as my page marker. Love it! 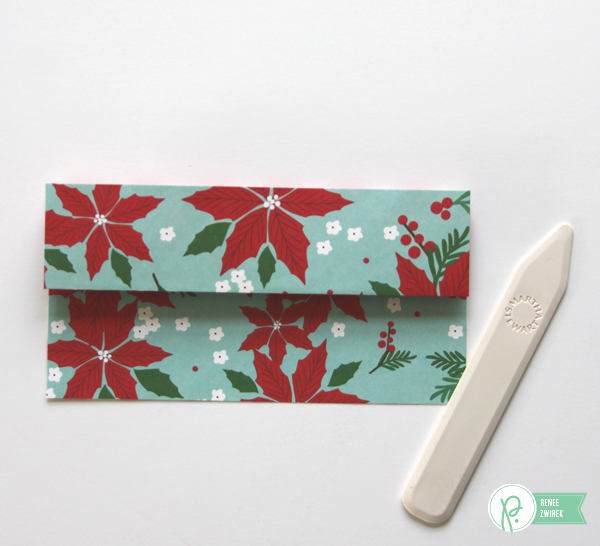 I love the ‘flaps’ – such a fun way to decorate without losing all your pen space! The Red, White & Blue speaks for itself! I hope you’re as excited as I am for the Fourth of July celebrations! 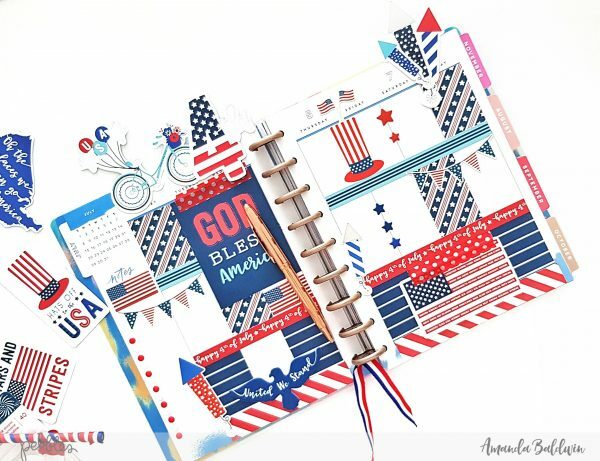 I can’t wait to see what your planners, organizers and notebooks will look like this week! Hello! 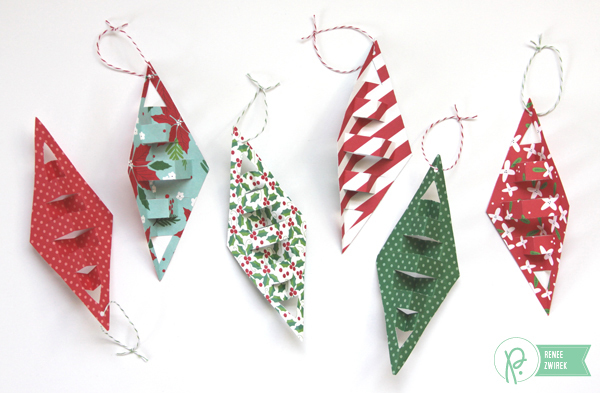 It’s Renee here today to share a step-by-step tutorial on paper ornaments I made using the wonderful Home for Christmas collection. 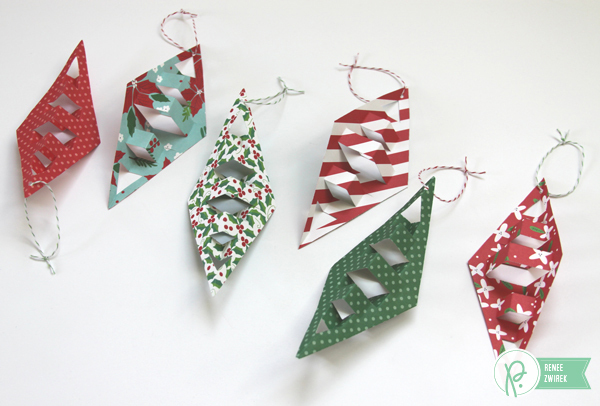 These paper ornaments are so quick and simple to make and look modern and fun on your Christmas tree. They’re also durable and flatten easily for storage so you can use them year after year. 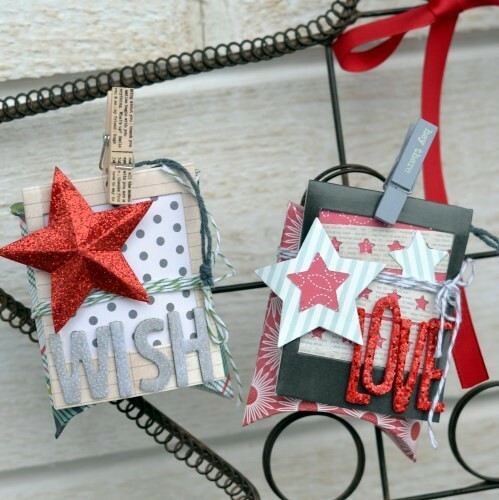 Your kids or grandkids would enjoy making these paper ornaments and can sprinkle a little glitter for that finishing touch. 1. 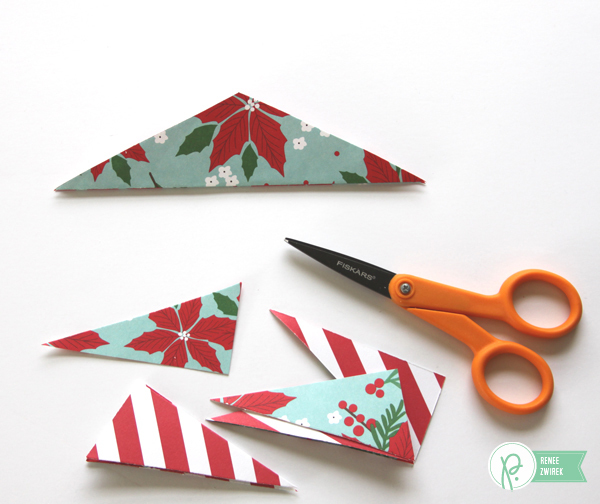 Take your 6″ square of pattern paper (I used Deck the Halls here) and position it face up. Then, fold it in half from top to bottom. I used a bone folder for a nice, crisp fold. …and flip the paper over to the other side. 3. Fold the top sheet in half. Now, you have a “W” in front of you after all the folds are done. 4. 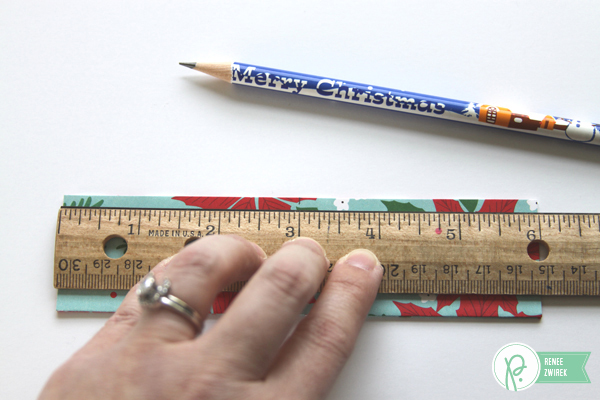 At the top of your “W”, mark the center of the paper with a pencil. You can also just pinch a tiny fold to mark the center of the paper. 5. Cut through all the layers from each bottom corner of your “W” to your center pencil mark or fold at the top of your “W”. 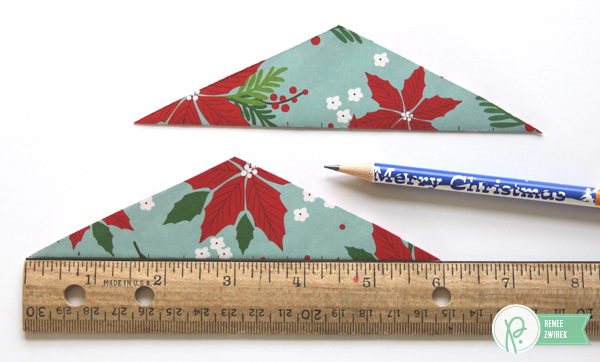 Then, separate the triangles (one 6″ square of pattern paper will give you 2 paper ornaments). Work on them one at a time. 6. Starting from the bottom center of the triangle, mark about ¼” on either side of the center and then mark about every ½” after that. You can also eyeball this part from your pinch mark to make your cuts. Here’s a closer look at my measurements. I made 5 tally marks on either side from the center. 7. Cut parallel lines and stop about ¼” from the top of the triangle. 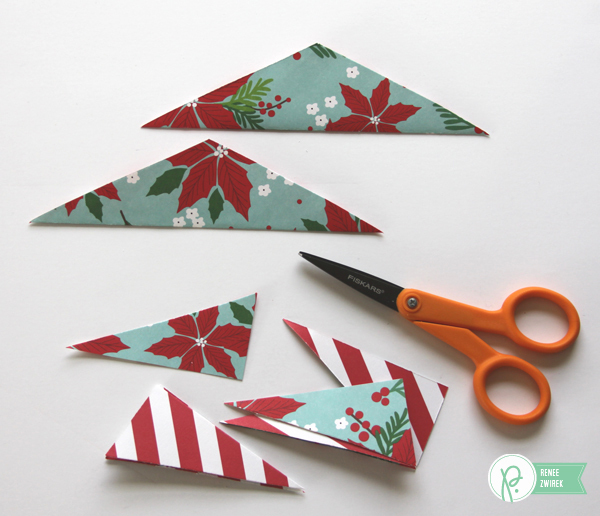 Cut a wedge at each end of the triangle. 8. 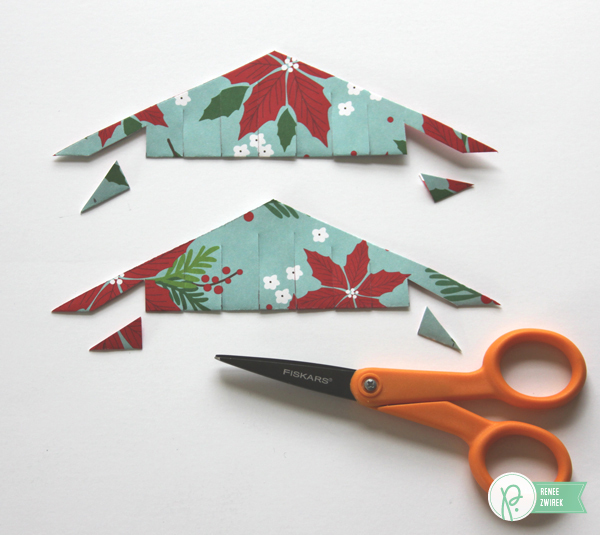 Alternate the fold cuts up and open to make the paper ornament 3D. 9. 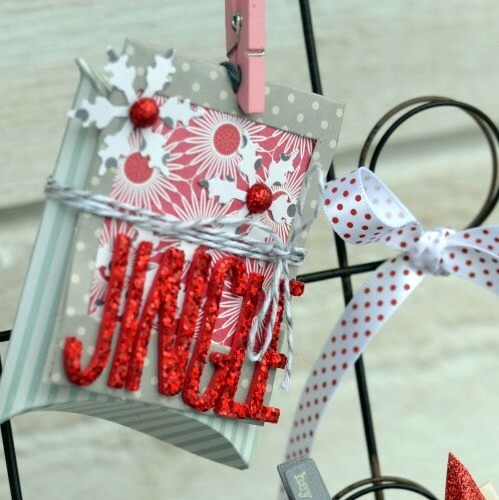 Use the small hole paper punch to make a hole near the top of the paper ornament and thread it with the Baker’s Twine (I used red and green) to hang the paper ornament. 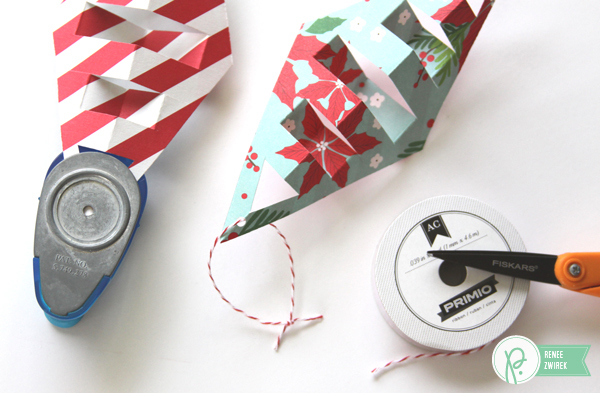 You can skip the hole and just run the Baker’s Twine (string or thread) through the top opening of the paper ornament. 10. Repeat steps 1-9 with all your 6″ squares of pattern paper. Merry Making! 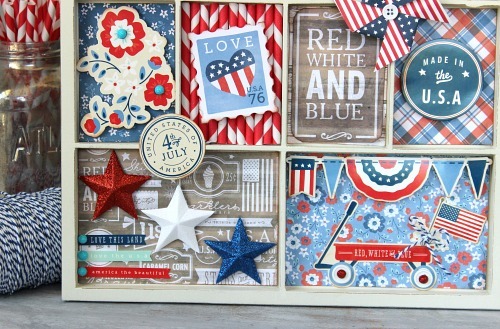 Today Designer Holly Gagnon is sharing a fun patriotic memory tray. 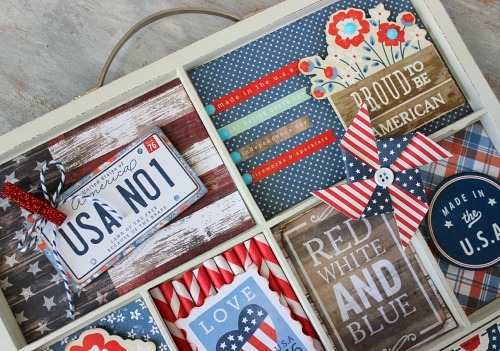 It’s a great project that would easily bring the spirit of America into any home! 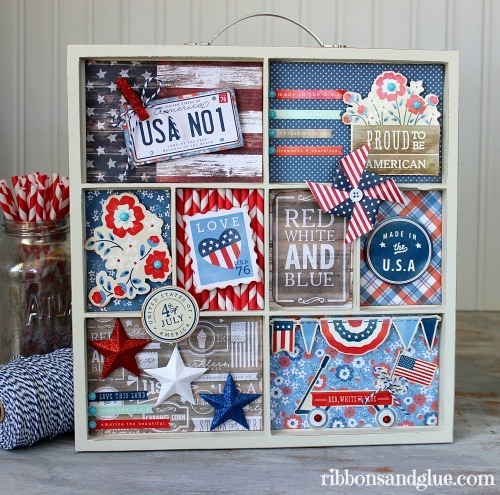 Holly here sharing with you an altered Memory Tray to Celebrate America using the Pebbles Americana collection. 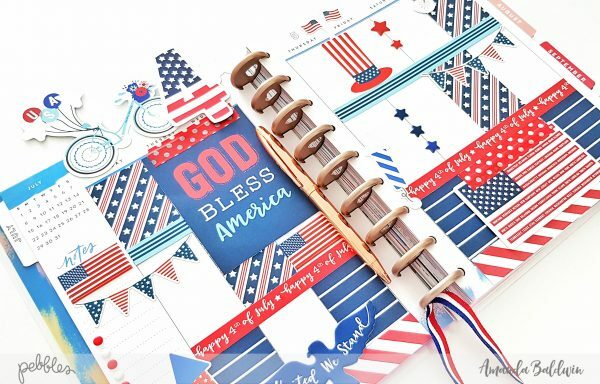 The Americana collection is perfect to use for any 4th of July decorations with it’s mixture of rustic and traditional American embellishments. 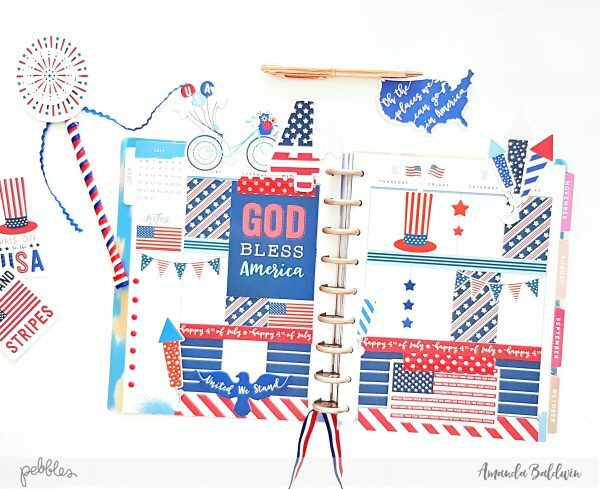 This memory tray was easy to decorate using various stickers, patterned papers, cardstock shapes, pinwheels and journaling cards found in the Americana collection. 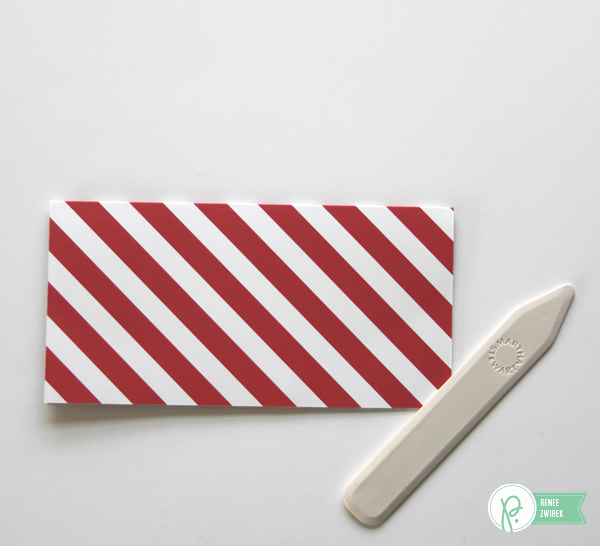 To add a unique dimension inside the tray, I added red & white paper straws into one of the slots and adhered a printed cardstock shape on top. We love the beautiful touch Marjan Pel applies to all of her projects. 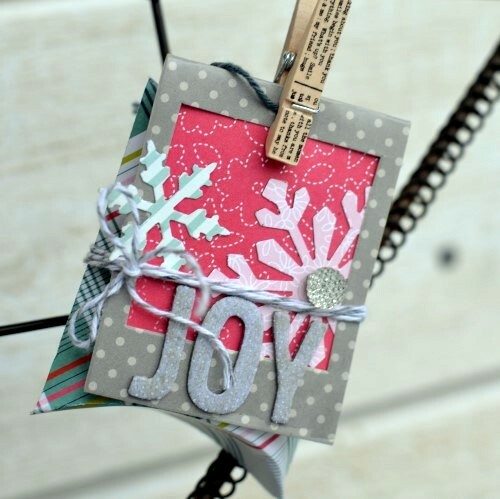 Today she’s sharing a lovely set of holiday gift boxes and tags that you will not want to miss! 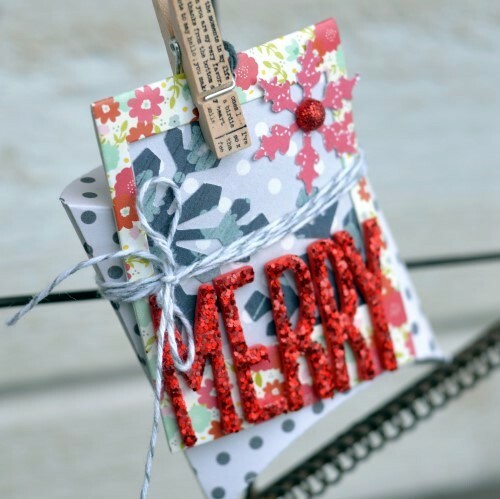 I love to make decoration and gifts for Christmas and the Front Porch collection by Pebbles is just perfect for this. The color scheme I used is red, grey and silver. For this project I made cute pillow boxes and embellished them with photo frame hang tags. 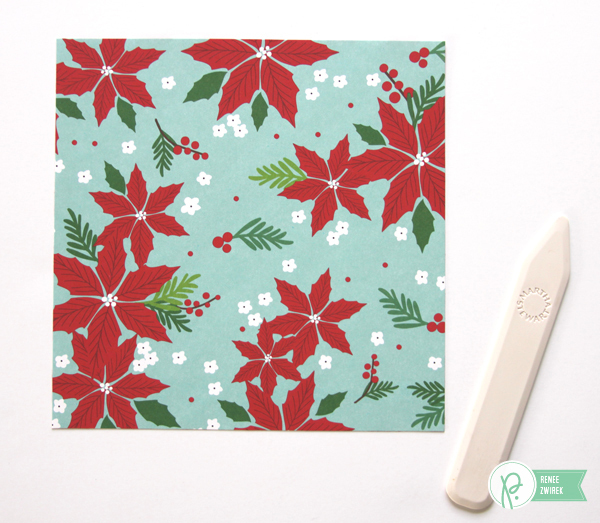 Instead of using photos I put small pieces of different patterned paper in each tag. 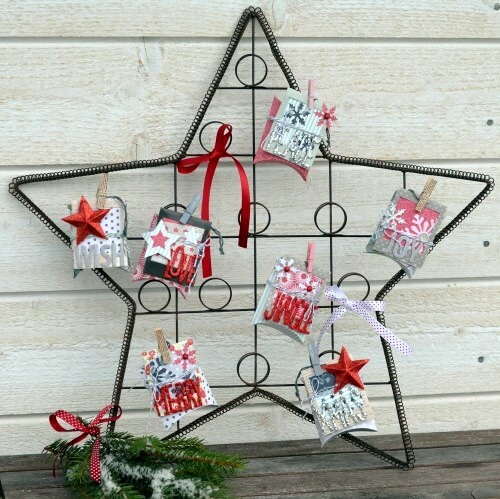 I used the 1.5″ create-a-sticker by Xyron to adhere the small strips of punched stars and small snowflakes to the paper. 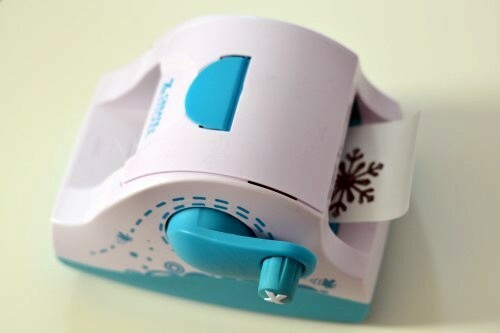 I adhered the big snowflakes with the help of the 2.5″ create-a-sticker by Xyron. I finished off the tags with typical christmas words like joy, peace and merry and some cute clothes pins. Here and there I adhered some glitter and crystal dots. The big star is really decorative with all the small festive pillow boxes. I filled the boxes with chocolate and sweets. My family will love this! 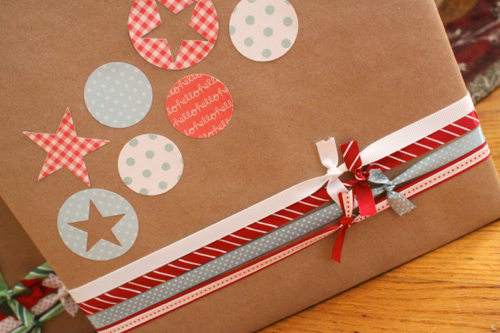 Kraft paper packaging is one of the best bases to build on when you’re wrapping up your holiday gifts. 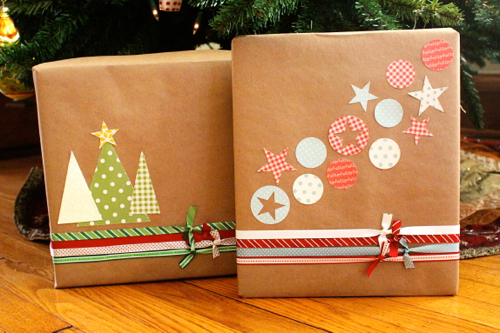 Today Design Team Member Emily Spahn is showcasing quick and easy holiday gift wrap that starts with…you guessed it, kraft paper! The holidays are a busy time! It seems like there is never enough time to accomplish everything you want and need to get done. 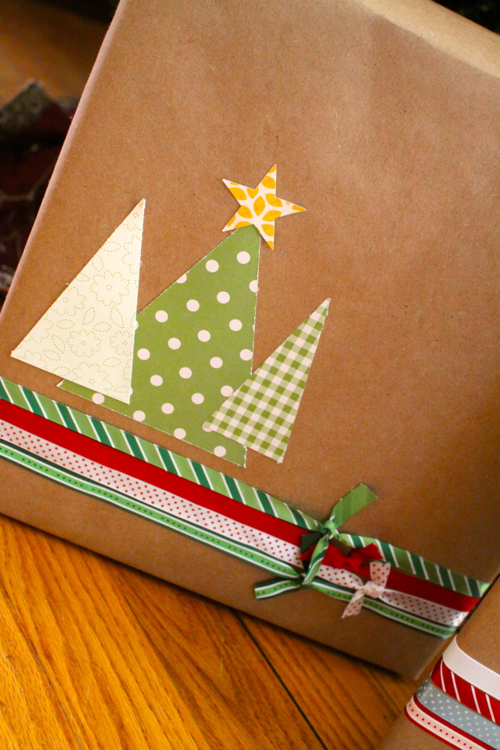 Today, I have a quick and easy way to spruce up your holiday wrapping! I started off with some plain kraft wrapping paper. A quick note, kraft paper and Scotch tape do not work well together!! 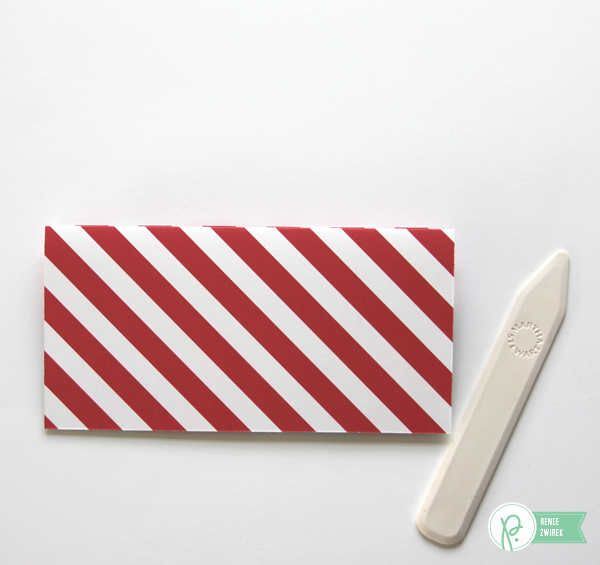 When you tape down your paper, make sure you use your fingernail or a bone folder to press the tape down, or you’ll find yourself with a half-opened package! I tied a number of the American Crafts Peppermint Express ribbons around the bottom of each package. I used my Xyron gluestick to help adhere the ribbon in place! 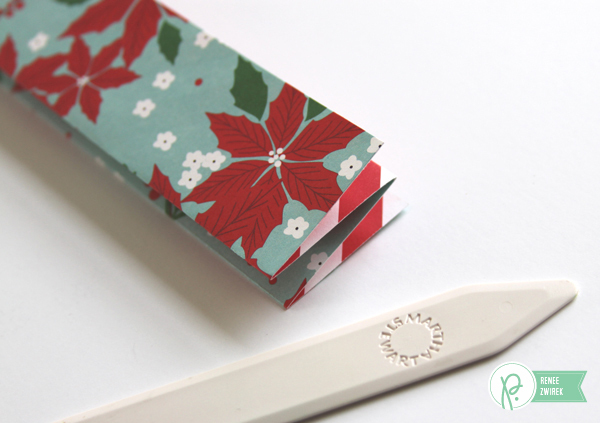 I was planning on using my Silhouette to create some designs for my packages, but I decided that this was a bit too time-consuming for my “quick and easy” project, so instead I just used my paper trimmer and a couple of punches to create some simple decorations. 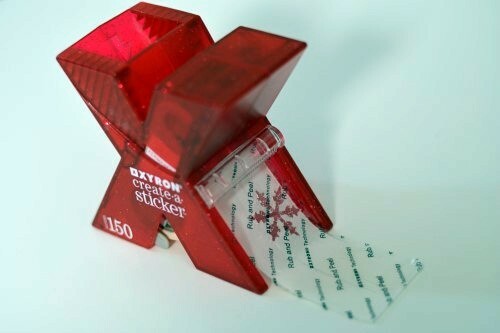 I ran them all through my Xyron Create-a-Sticker machine and stuck them onto the kraft paper. This is a fun way to make your gifts stand out at the holidays without taking up precious cookie-baking or carol-singing time!